According to popular surveys, getting fit and losing weight are the most common New Year’s resolutions. Fitness centres and gyms rely on this time of year to boost their budget, banking on New Year best intentions only to see the number of newcomers coming through their doors dwindle as the year progresses. As lives swing back into normal routine when holidays end and work and school start, gym attendance buckles under the pace and pressures of normality. One of the most often used excuses for non-attendance is ‘I can’t find the time’. With traffic, work demands and family responsibilities etc. it is difficult, but by cutting away the time required to get ready, get there and get back, you can simply get on with it. A home gym is the ideal solution for those who want to keep the New Year resolutions alive and kicking while the clock is ticking. Creating a home gym that fits comfortably into your home is a challenge. Although we cannot advise on what equipment to buy, here is our home gym work-in routine. Gym equipment is not small and some of it is cumbersome to haul out and pack away before and after each workout session. First prize is to discover some space that can either be repurposed or through a shuffle of furniture and functionality can reveal itself; perhaps a cluttered garage, a spare bedroom, some space in a study or a corner of an enclosed patio. Once you have determined what space you can allocate to your home gym, then you will have direction on what equipment you can accommodate. Don’t be disappointed if you do not have the room for your all-in-one apparatus, there are many other workout options that work well in smaller spaces. If you discover that the best option is to subdivide a room i.e. a large living room split into a TV lounge and a gym or a garage split into a workshop and workout space a great option is to install slide away or fold away shutters that can be pulled closed to section the space off and create some privacy or left open when not in use. Whether we admit it or not, walking into a public gym can make us feel self conscious; thinking all eyes are on us critiquing our body shape, our outfit and it gets worse when we walk out, not to mention in the shared showers. Home gyms afford us the ultimate privacy and if you install practical window coverings such as blinds or shutters, you can control that privacy 100%. 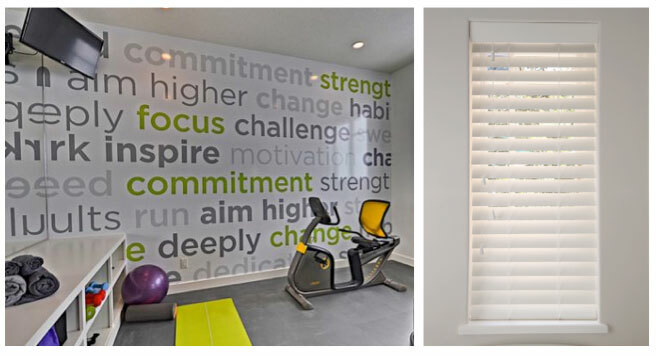 Blinds and shutters are the ultimate home- gym window finish and they are perfect for ventilation and light control, both very important when trying to create the ideal environment to exercise in. Exercise is sweaty work so ensure that you install practical easy-to-clean surfaces, flooring and finishes. Wood laminate, treated concrete, rubber mats or tiles are the best floor options and blinds or shutters for windows. Be sure to choose the right shutters and blinds though, those that withstand high humidity and moisture. One of the possible negatives about a home gym is that you are left to your own devices and have no pressure from personal trainers, gym buddies or classmates to keep it up and you miss out on the motivation and inspiration you get from others. To ensure that your solo routines don’t become so-so routines amp up the fun and entertainment value of your home gym. Invite a friend in the neighbourhood to join you for one or two sessions per week. We hope you can put some of this advice into practice and keep those New Year resolutions alive.